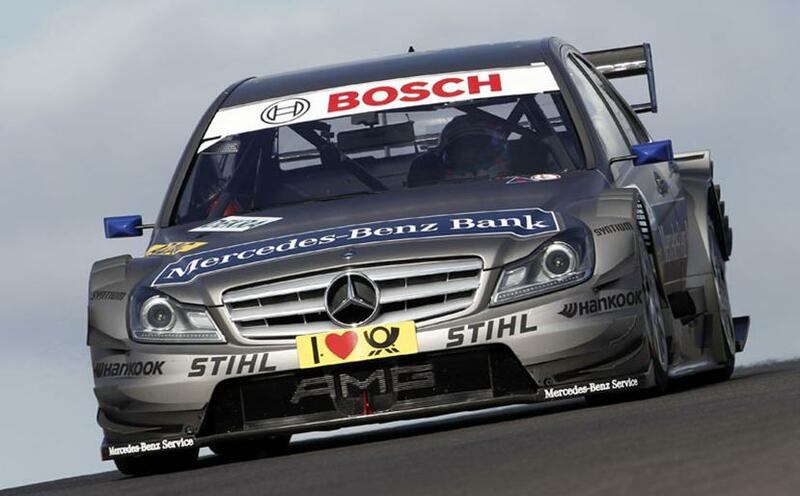 Mercedes-Benz drivers lock out the front row on the starting grid for the fourth round of the DTM season at the Lausitzring: with a lap time of 1:19.119 minutes in qualifying for the race on Sunday, Bruno Spengler (Mercedes-Benz) claimed the best starting grid position. His team-mate Jamie Green (Mercedes-Benz) will be lining up alongside him on the front row of the grid. The Brit came 0.405 seconds short of Spengler’s fastest time. With Mattias Ekström and Martin Tomczyk, two Audi drivers are on the second row. Swedish driver Ekström was classified third in qualifying. Tomczyk, who won the race at Spielberg in Austria a fortnight ago, claimed fourth place on the grid. A full press release with quotes will follow shortly. 13.40 hrs Start of the session. Rahel Frey is the first driver on the track. 13.42 hrs Frey the first to set a lap time: 1:21.689. 13.44 hrs Vietoris currently tops the time sheets with 1:20.404. Then Albuquerque takes over with 1:20.179. Kristensen misses his braking point for the first corner, goes straight on, but continues. 13.45 hrs Scheider is first with 1:19.860. 13.46 hrs Oliver Jarvis takes over first place with 1:19.805, but is then outpaced by Ekström with 1:19.785. 13.47 hrs Jarvis on top again with 1:19.631. 13.49 hrs Bruno Spengler is now fastest: 1:19.595. 13.51 hrs Coulthard moves up into fourth place: 1.19.737. Green is fastest now with 1:19.424, followed by Vietoris with 1:19.593. 13.53 hrs Albuquerque is now second: 1:19.531. 13.54 hrs Mortara on top: 1:19.297. Tomczyk moves up into fourth with 1:19.372. 13.56 hrs End of the session. Paffett still moves up into sixth. Molina remains fastest from Albuquerque, Molina, Tomczyk, Ekström, Paffett, Green, Kristensen, Scheider, Vietoris, Spengler, Van der Zande, Jarvis and Stoddart. Not qualified for the next heat are Coulthard, Engel, Schumacher and Frey. 14.03 hrs Start of the next heat. 14.05 hrs Kristensen on top with 1:19.210. 14.06 hrs Tomczyk is fastest with 1:19.201, but is then outpaced by Jarvis with 1:19.183, Ekström with 1:19.159 and Green with 1:19.087. 14.12 hrs Tomczyk takes over first place with 1:19.053. Albuquerque moves up to seventh. Paffett is new leader with 1:19.044, followed by Green with 1:19.047. Kristensen off the track, continues. 14.14 hrs End of the session. Scheider, Vietoris, Molina, Mortara, Van der Zande and Stoddart don\’t make it into Q3. 14.15 hrs Ekström ends up fastest with 1:19.004, followed by Paffett, Green, Tomczyk, Spengler, Jarvis, Kristensen and Albuquerque. 14.22 hrs Start of Q3. 14.28 hrs Kristensen is the first driver to go out on the track. Albuquerque, Paffett, Green, Tomczyk and Ekström also go out. 14.31 hrs Kristensen tops the time sheets with 1:19.628. Albuquerque takes over first place wiht 1:19.545. Paffett runs over the kerbstones, continues. 14.32 hrs Tomczyk is now fastest with 1:19.035, Green is second with 1:19.133. Then Spengler takes over first place with 1:18.973. Spengler is the first driver to set a lap time under 1:19. 14.33 hrs Paffett moves up into fourth as Green is now fastest: 1:18.943. End of the session. Green remains fastst from Spengler, Tomczyk, Ekström. Not qualified for Q4 are Paffett, Jarvis, Kristensen and Albuquerque. 14.43 hrs Mattias Ekström: 1:19.591. 14.45 hrs Martin Tomczyk: 1:19.622. 14.47 hrs Bruno Spengler: 1:19.119. 14.49 hrs Jamie Green: 1:19.524.